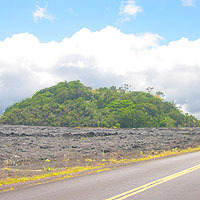 A'a lava lines the road. Examining rocks with Mauna Kea behind. Looking down into a lava tube. Who says scientists don't have a sense of humor? The summit trail beings here. The old trail used to climb this steep hill. The road we will be taking up to the Weather Station is a roughly paved narrow road. The beginning of the road has deteriorated a bit and contains potholes so be a bit careful. Also be very careful around turns as the road is only slightly bigger than a car and you may not be the only person on the road. 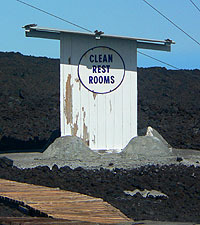 There are no services available along this drive, though a crude but clean bathroom (no running water) is available at the Weather Observatory. Bring water and food. This drive starts at about 6,560 feet above sea level and takes you to 11,141 feet in a very short period of time. If you intend to take the Hike to the Summit you will go to 13,679 feet. The high altitude affects people in different ways. Please heed the following warnings! Breathing - Do not take this drive if you have respiratory problems. 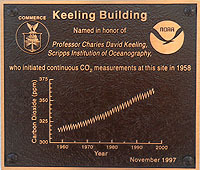 The summit, at 13,679 feet has about 40% less oxygen than at sea level, thus breathing is more difficult. Even if you don't take the hike, breathing at the 11,141-foot level is noticeably different. Heart - Do not take this drive if you have any type of heart condition. High altitude causes your heart's arterial vessels to dilate. Your pulse rate will increase and movement will be more laborious at the summit. Wear UV Protection - Always wear UV Sunglasses at the summit and if you are not a regular to our mountain summits wear a high number UV sunscreen. It is possible, on clear days, to burn within 15 to 20 minutes of exposure. Watch Your Food - Try to avoid eating foods that cause gas or bloating at least 24 hours before you plan to go to the summit. The increased pressure at the summit can cause discomfort and pressure. You will, however want to bring snacks with you to the summit as many people get unusually hungry (especially for sweets) when at the top. Acclimate 20 to 30 Minutes - We encourage you to take our Pu'u Huluhulu Hike which is where this drive starts out, to help acclimate to the altitude. Wear Warm Clothes - It is both cold and windy near and at the summit. Wear warm clothes, a jacket and you may want to consider gloves and a hat. Note: a clean pair of socks worn on your hands can be used as mittens. As if the above list were not enough... the largest problem near or at the summit is altitude sickness which symptoms range from irrationality to nausea and even fainting. It is common for couples to fight at the summit only to totally forget why once they get back down. To help avoid altitude sickness move slowly while at the summit. Avoid talking and moving at the same time. Take slow, deep breaths. There are many side roads along the way. While many of the side roads do lead to interesting sights we do not recommend straying from our described drive for a variety of reasons, including getting lost. While we offer a number of chances to get out and explore, do not wander too far from your vehicle. 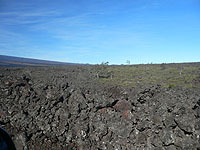 Mauna Loa, unlike Mauna Kea, is easy to get lost on. If weather sets in it can quickly become impossible to tell which direction your car is in or even whether you are walking up or down the mountain. If you intend to take the trail to the summit additional warnings apply, please see the Mauna Loa Summit Hike for more information. The best weather for this road is as clear a day as possible. Often there will be Hilo-side clouds but the middle of the saddle, where we are going up, should be clear. The clearer it is the more beautiful the scenery will be. On especially clear days it is possible to see Maui and some of the other islands from various points along this drive. Do not attempt this drive in bad weather. If fog or clouds begin to set in leave immediately! This road is very dangerous in poor visibility and it is extremely easy to get lost or hurt on Mauna Loa should you leave your car. Regardless of which direction you came from, we start this drive at Pu'u Huluhulu, which is at the 28 mile marker on Saddle Road. 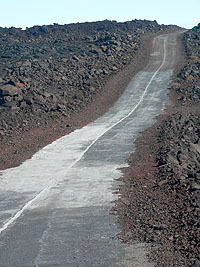 On the Hilo side of Pu'u Huluhulu is a red dirt road that runs right alongside and beyond the cone. If you are coming from Kona-side, when you get to Pu'u Huluhulu you will see a left to the summit of Mauna Kea and a right that dead ends at Pu'u Huluhulu itself. Go past these roads and immediately after the cone you will see another, rough, red road, on the right. Take this road. If you are coming from Hilo-side, as you approach Pu'u Huluhulu and the road to the summit of Mauna Kea, just before Pu'u Huluhulu will be the rough, red road on your left. Take the road. You will notice that as soon as you turn on the road, and drive to the cone, that there is a gate in the fence. Park near the gate as this is where we are going to start our Scenic Drive. What a better way to start a scenic drive than with a scenic hike. 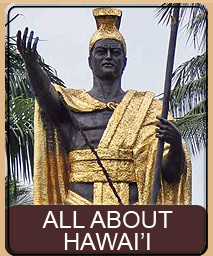 Pu'u Huluhulu, that you are now parked next to, is one of two similar cones with the same name. 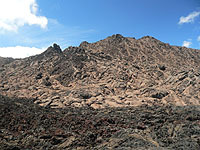 The other Pu'u Huluhulu is in Hawai'i Volcanoes National Park on the other side of Mauna Loa. The word Pu'u means hill and Huluhulu means hairy, furry, and feathery, alluding to the abundance of trees that adorn the hill. This sanctuary is part of the Na Ala Hele Hawai'i Trail and Access System and was originally constructed by the Youth Conservation Corps and is currently maintained by the Hawai'i Natural Area Reserves Program. This hike up this 200-foot cinder cone takes you from 6,560 feet to roughly 6,720. 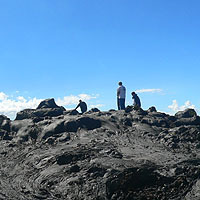 We want you to do this hike to help you acclimate to the altitude before going up Mauna Loa. Altitude sickness can be a real problem and this hike can help you adjust more swiftly to the summit changes. There are three trails that wind their way up to the top. You are parked at one of the more rugged, but fun trails, and an easier trail is accessible at the other entrance to the cone. We have already reviewed the Pu'u Huluhulu hike and we invite you to read the review to find out more about this short, fun, and scenic hike. So back into our car from that invigorating hike and we start off on our drive. 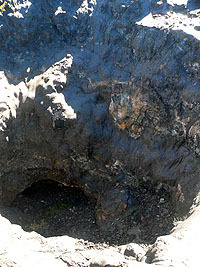 Initially, as you drive past the backside of Pu'u Huluhulu there is a black, flat pahoehoe flow. As you continue the flat pahoehoe gives way to a more rocky combination of older pahoehoe and rough a'a flows. Unless someone has done some long overdue patching you will probably notice that the road is a bit potholed and rough in spots. Oddly, the road condition improves the further up the summit you go (to a point). The road is somewhat curvy in this early section, going around mounds of a'a. 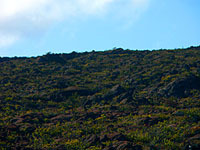 The older flows on the left have quite a bit of 'Ōhelo plants with their tasty berries as well as young 'Ōhi'a Lehua trees. Look in here for families of mountain goats and wild pigs that like to graze around this area. Around odometer 1.9, on the right you will see the famous Charles De Gaulle rock which, under the right sunlight, supposedly bears a resemblance to the French President of the same name. 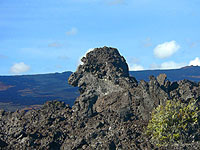 We googled for pictures of dear Charles but could not find any to compare to our hardened lava gentleman, so we can merely take it on faith that the rock received its name because of its uncanny resemblance to the late French President (we hear it's the nose). The road continues to curve and continue through lava fields. Drive carefully as the narrow road and blind curves often conceal oncoming vehicles. After a bit the road being to straighten out more and the view opens up. At around odometer 3.8 you will curve past a very wide, well bulldozed, dirt road. This is the Old Hilo To Kona Road that was going to speed up the time to get to Kona on Saddle Road. Over 10 miles of wide, boulevard-sized roadway was bulldozed before the military base further down Saddle Road nixed the entire project. Currently the road is off limits and at one point is gated at the military boundary. Continuing on, you might see off in the distance on your right a cross on a hill. This is a monument to two Portuguese brothers who died and there is actually quite a developed memorial. A small dirt road leads to this hill where family and friends have chiseled out crude stairs to the cross and an extensive cultural monument. Not really worth a side trip if you're in a hurry, but a nice drive past some other interesting cones if you have the time. At about odometer 5.6 you will again enter an area where there is a lot of 'Ōhelo Berry plants on the left side of the road, with nothing but rocky lava on the right side of the road, quite an unusual sight. As you ease into odometer 6.2 the lava fields begin to contrast in colors, with reds, browns, grays, and blacks. These colorful lava fields are of different ages and chemical compositions allowing them to weather differently and display different colors over time. In fact, it is this colorful lava which makes this drive so enjoyable. 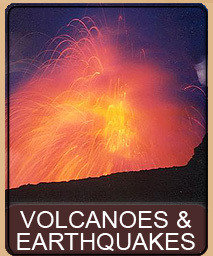 Unlike Mauna Kea, which is brown and red and mostly ash, Mauna Loa has little ash versus the huge quantities of pahoehoe and a'a lava flows. This is most certainly due to the age of the volcano, with Mauna Loa still active and Mauna Kea well into the dormant cycle. At around odometer 7.1 you may see a bit of the road that is silvery in color. This 30-yard long area was painted an aluminum color for a commercial by Fiat (we imagine, to make the road look wet and shimmery). It is always fun to be watching TV and see some commercial where they obviously shot the background at some scenic location on the island. 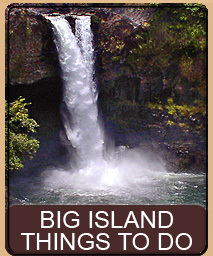 We can just see the advertising agency coming up with ideas... "and we should film it in Hawai'i"... "yes yes, Hawai'i"... "great idea, yes, Hawai'i"... though it is too bad they left the environment disturbed, at least temporarily. As we continue we can see ahead of us, our next stop at the microwave stations. The road here is quite different than the drive to the summit of Mauna Kea. When you go up Mauna Kea it is just that... up. There is no down, only up. But this road is much different. Instead of constantly gunning the engine to make your car climb, you find that you are going up and down small hills. There are so many ups and downs you really don't feel like you are climbing at all, just going up and down these little frequent hills. This is also why it is so easy to get lost on Mauna Loa. If you are stumbling around in fog or rain there is no orientation for up and down. Each hill you climb is followed by a valley, so you don't know which way you're going and can easily end up walking in circles until you fall into a lava tube. At Odometer 8.2 our road abruptly ends at a T-junction in the road. To our left the road continues past a row of telecommunications buildings and to our right the road disappears into the distance. Pull up off the road, towards the right and get out, we are going to take a little stroll. Just a word of warning, while stopped at this point on one occasion a Department of National Resources vehicle pulled up and two extremely serious DNR agents got out and questioned our being there. Only after assuring them we were on a trip up to the weather observatory, and allowing them to look into the back of our jeep, did we satisfy their curiosity. Apparently they were looking for illegal, out-of-season hunters and just wanted to make sure that we were not packing shotguns. What started out as the one small microwave station has now blossomed into a cluster of spooky buildings bristling with antennas and dishes and surrounded with barbed wire fences. This collection of receivers and transmitters is part of the island communications system. 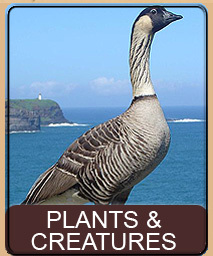 You will note that many are pointed a similar facility and a cone on Mauna Kea. And as you turned around to do that, you suddenly realized just how high up you have really driven! The view from this point is rather stunning, especially on a clear day. 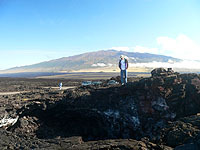 You are about half way up the side of Mauna Loa with a spectacular view of Mauna Kea behind you. If it is very clear the island of Maui should be evident behind, and to the left, of Mauna Kea. The road that passes to the left, past the communications buildings, is part of the old Stainback Highway. This road used to cut over the side of Mauna Loa past Kea'au and go into Hilo. However, the building of the Kulani State Prison facility caused a major portion of the southeastern side of Mauna Loa to be fenced in and allocated to the prison. Stainback Highway is now blocked off from the prison near the town of Kulani, and this dirt road is blocked off after a few miles, with no other exits. "A major nemesis to the operation of the observatory over the years has been the roads used for access to the observatory. The standing joke for those who have worked there is that the access road is the only road on the island that no one will lay claim to for fear of being obligated for its maintenance. The first road was laid out (by some sweet-talking and creative accounting and financing of several government agencies) with prison labor from the Kulani honor camp. As it is jokingly retold, an inmate was set on a bulldozer and told to cut a road to the summit of Mauna Loa. When funds ran out, the observatory was built at the end of the road." 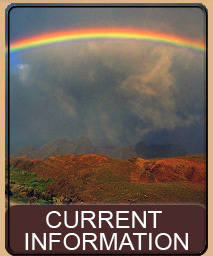 "The first route used for access began at the Kulani honor camp turnoff on the belt highway. This preexisting road was called the Stainback Highway and very soon was corrupted to 'strainback' highway by those who made the weekly trips to the observatory. 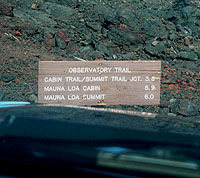 It terminated at the Kulani honor camp (elevation 7,000 It). The daily search and shakedowns of people and vehicles by the guards at the camp were an unbelievable experience for first-time travelers to the observatory. Later the guards got to know the staff and waved them through the camp unless something was amiss. Above the camp the road ran along the northeast ridge and required four-wheel-drive vehicles. A good trip with no breakdowns required 2 hours for the 40 miles. It took a hard head, resilient behind, and cast-iron stomach to make the journey and keep one's breakfast. Maintenance of the road was virtually nonexistent, and the gravel surface deteriorated rapidly with the heavy tropical rains. It was not unusual to come across wild boar rooting among wild orchids on the shoulder of the road in the early morning and later to see wild goats eating ohelo berries along the road above the camp." It was not until 1963 that the road you just traveled was cut to allow a less painful, and more direct route to the observatory. This also allowed the honor camp to extend into a full prison and seal off the now disused Stainback Highway. But enough of the history of the area, there is more to do at this stop than hear about eerie telecommunications buildings and sweaty prisoners. On one corner you will spot a small weather station that appears to be the remains of a rain gauge. Ignore it and instead leave your vehicle and go to the center of the intersection of the T and walk straight ahead, as if the original road continued on. You will step up and over the lava. Veering a bit to your right continue until you spot the huge open lava tube that is about 20 feet from the road. This is a very nice lava tube and you should walk around it, and continue behind it to find a continuation that you can actually get down into and examine. These tubes, once filled with 2000° flowing liquid rock, would occasionally lose their roofs allowing lava to spill out of the tubes and down the sides of the volcano, and once cooled, allowing us to climb inside and explore! Back into the car, we continue by going right at the T-junction. A line of powerlines now extends far into the distance, terminating at the still invisible Mauna Loa Observatory. Continue to around odometer 10.7 where you will see a red cinder side road to the left with an old tattered windsock on a pole. The cinder road goes to a distant red cinder cone that was once used for mining the red cinder rock. As you pass the windsock begin looking on the right side of the road. After a couple tenths of a mile you should see a small rise over fairly smooth pahoehoe lava and some very large, smooth, and round boulders sitting near the top of the rise. Pull off the road; we're going to explore Chocolate Bonbon Hill and the Dipping Pot. Scamper up the small rise that is about 25 or so feet from the road to explore those smooth rocks. As you approach the rocks you will be amazed to see a hole, about 30 feet deep and 20 feet across with extremely smooth sides. It's as if this was once a fondue pot filled with chocolate that got too hot and spurted out, covering everything in a smooth even layer. The rocks are impressively round, big, smooth, and coated and you might imagine that these were hurled hundreds of feet into the air, to be tumbled smooth as they fell. But these are not actually lava bombs. If you noticed, on your ride so far, you have passed many round looking rocks on the various flows. Most of them have been in fields of a'a. How does a round rock end up in a broken and gnarly field of a'a? Not by being thrown into the air like a true lava bomb, but instead by being dragged along the ground, tumbling as it goes. As it is tumbled it slowly becomes round until it becomes the near round shapes we see in these areas. So these round-coated rocks are actually nothing more than dragged a'a which then got coated when the pit opened and burped out the very liquid pahoehoe. If you look down slope from this point you will see other coated rocks in the distance. And even further down, if you feel like the extra stroll, it is worthwhile exploring these other areas. Each group of coated round rocks will be clustered around a pit. Some of the pits feature spectacular colorations of yellows, whites, and vivid purples. In fact, there are many such pits on this side of Mauna Loa, including some in the original part of the road before the T-junction that you were just on. All are worth exploring as each is different in their own individual way. How do these pits form, you may wonder? Most likely these sit directly above large lava tubes. Surges upstream and blockages downstream can cause lava to break through to the surface. 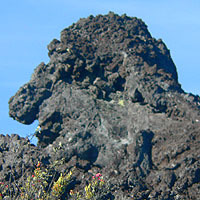 In situations where the pressure was great enough, lava would be blasted skyward or burped a few yards to fall back and coat the nearby land. If the consistency of the lava was fluid enough the coating would be even and smooth, exactly like what we see here. Note that MLO has placed a security gate on the driveway. It is no longer permitted to go onto MLO property without permission. Enough indulging in Chocolate Bonbon Hill - back to the car and on we go. Following the powerlines we go onward through a huge a'a field around odometer 15. In the distance the buildings of the Mauna Loa Observatory are starting to appear. 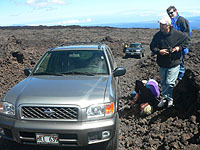 At odometer 17 we have reached the Mauna Loa Observatory and a small parking area. This is the end of the road, at least for regular vehicles. Park your car at this little parking spot. Standing at the end of the road, you will see that it continues on as a rough dirt road. This road is the 4-wheel road to the summit, which we will learn more about in a bit. To your left is a paved road that goes up a hill to the buildings that line the ridge. While you used to be able to drive directly up and into the Observatory complex, a recently installed electronic gate now sits about halfway between the parking area and the top of the hill. 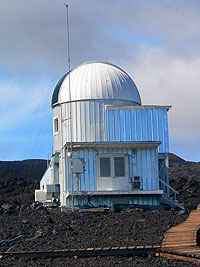 The Mauna Loa Summit Observatory was first started in November of 1951 by the US Weather Bureau by placing a very small building at 13,450 feet, close to the true summit of Mauna Loa. 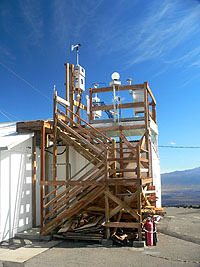 A variety of sensors dotted the volcano from 5,180 feet to the summit that was used to sample the atmosphere and gather data. Difficulties, however, in servicing the equipment in the harsh conditions and even harsher road made reliable and frequent reading nearly impossible and the stations were quickly abandoned. Four years later, in November 1955, the Weather Bureau again began work on an observatory, this time located at the end of the road where it stands today. The building was dedicated on June 28, 1956 and many important people including the Governor of the Territory of Hawai'i attended the ceremony. 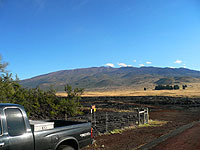 In fact, over the years many important and famous people have visited the Mauna Loa Observatories. In 1965, a number of NASA astronauts who were here for lunar simulation training visited the observatory, including Buzz Aldrin and Roger Chaffee. 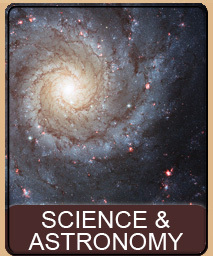 Over the years the observatory continued to flourish and produce cutting-edge scientific research. A major upgrade in 1977 made the area more livable and added the public parking facility. Over time more and more buildings appeared to accommodate newer equipment and projects. The 1984 eruption of Mauna Loa, that came within 12 miles of Hilo, at first threatened to overrun the observatory. However once the lava shifted to the northeast rift zone and began to flow towards Hilo the only problems to the observatory was loss of power. 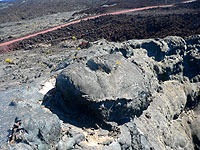 However, the event did make an impact as two years later, in January 1986, a huge lava barrier was created on the slopes above the observatory. Not easily seen from the observatory itself (it is better seen from above, on the 4-wheel road), this huge earth damn is like a giant upside down V that sits directly above the observatory. The theory being that the lava will be diverted to flow around the observatory, not through it. This, however, has luckily never been tested. 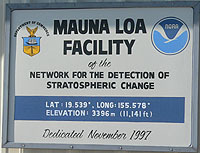 Today Mauna Loa Observatory is operated jointly by NOAA (National Oceanographic and Atmospheric Agency) and the NDSC (Network for the Detection of Stratospheric Change). Research is done in a number of areas including monitoring our atmosphere for concentrations of gasses, pollution, ozone, water vaper as well as studying solar and UV radiation, meteorology, lightning, and even cosmic dust collection. Experiments are conducted, through the governing agencies, from a variety of scientific research facilities and universities around the world. The data collected in this research goes on to impact just about every element of our lives, from the weather over our head to the emissions from our vehicles and factories. A view of the Observatory buildings from the road. 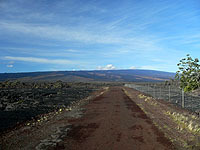 Returning to your car, the dirt road continues to the summit of Mauna Loa. 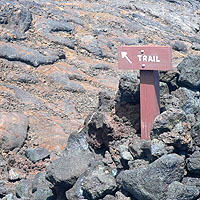 If you walk a short distance down this road you will encounter a trailhead sign, which is the old trail to the summit of Mauna Loa. 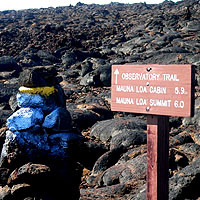 Many people hike the trail to Mauna Loa summit every year. In fact, on the day we went we encountered two other groups on the trail. Most people do not begin the trail at this point, however, and prefer instead to continue about another mile along the road until the trail crosses the road, where they then switch over to the trail. 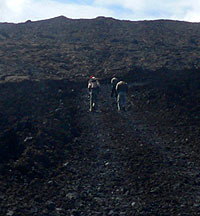 The trail itself is about 3.5 miles to North Pit, the northern edge of the caldera, and from that point it is another 3 miles to the summit itself. This is a very difficult trail not only because of the altitude but also because of the cold weather and steep uneven grade. Furthermore, the trail has been modified slightly since older maps were produced making some maps outdated. This is not a trail to do lightly and it requires proper preparation and adequate supplies. Any hikers should plan for emergency overnight stays in case the weather turns and it is not uncommon to have freezing rain and even snow in the summer. This concludes the "any-car" portion of this drive. The rest of this scenic drive requires a 4-wheel vehicle. If you did not bring a 4-wheel vehicle you can return home by simply going back down the way you came up. So here we sit at the end of the paved road at the Mauna Loa Observatory junction. It is possible to actually drive to the summit (or near the summit, more on that later) but before you go scooting up to the top of the volcano here are some special warnings about this section. This portion of the drive REQUIRES a 4-wheel drive vehicle with HIGH CLEARANCE. We cannot stress this enough! This is NOT a trivial drive! We do NOT recommend renting a 4-wheel drive vehicle, especially from Harpers, for this drive. Many of the car companies (especially Harpers) examine the underside of the vehicle and will note any changes and charge you. It is impossible to do this drive without bottoming your vehicle out from time to time. You WILL scratch and dent the underside. We HIGHLY recommend taking more than one 4-wheel vehicle, or at the very least taking a normal car and leaving it parked at the Mauna Loa Observatory. There is safety in numbers and having two vehicles gives you twice the safety factor. Even if you only have one 4-wheel vehicle, taking another vehicle and leaving it at the Observatory would require much less walking if you should encounter problems. On this particular trip we were also escorting two seasoned hikers, Martha and John Clark, up to a portion of the trail to North Pit. The Clarks have hiked all the other summit trails (on the other side of the summit) and portions of this trail, but had not hiked the small segment to North Pit and the summit. We intended to drop them off at one of the places where the trail intersects the road, and then continue to the summit to wait for them to reach us. Also accompanying the InstantHawaii team were a group of fellow workmates from Subaru Telescope and also an InstantHawaii friend, neighbor, lava junkie, and National Park Volunteer, David Boyle and his brother Ron Boyle. So as 11 people crammed into three 4-wheel vehicles - our Jeep, a Ford, and a Toyota Pickup, we formed a caravan and began the drive. It is not guaranteed that one can actually drive to the summit. John and I have been to the summit two other times in the last three years. As you near the summit, (I estimate about 3 miles from the end of the road) there is a Hawai'i Volcanoes National Park gate. For the last two trips this gate has been closed, but unlocked, and can be opened and closed behind you. Once beyond the gate you can actually drive to within about 500 yards of the summit, to a scientific monitoring station, and then do the trivial hike to the very edge. If, on the other hand, the gate were locked, we would need to park at the gate. In this case we would need to make decisions on whether or not we were going to hike the rest of the way. With this in mind, we began our drive. First, let me point out what type of road this is. A normal vehicle would make it about 200 yards on this road before they encountered the first daunting conditions. The road itself varies from easily drivable to huge blocks you have to bounce up and over. In portions the size of the rocks are such that if you don't have enough momentum you can easily dig in and get stuck, and in other portions you may need to get out and look at the road ahead to see just how your going to get over it. This is a road for a seasoned 4-wheel driver, to be sure! (and don't forget that your at altitude so your thoughts are not especially clear). Another note here is that we will not be exiting the same way we entered. While you certainly can do this as a loop there is actually an alternative road out that exits below the Observatory saving several miles of rough road. We say road out because it would be impossible to take this road up without getting stuck, but taking it down is much easier to do. At the end of this page you will also find complete GPS files so you can follow our path both up and down the mountain. These files are complete, from Pu'u Huluhulu all the way to the summit, with all the stops in this article marked as waypoints. Ok, so setout we did. Just after starting on the 4-wheel road we noted a Volkswagon parked off the road. After a bit we encountered the occupants of the vehicle hiking along the road. Interestingly, these hikers actually beat us to the North Pit - an indication that driving is not necessarily faster than walking (the trail is MUCH shorter than the road, which winds up the side). At odometer 17.9 you will encounter the trailhead intersecting the road. This is where most hikers leave the road and start the trail (as opposed to the first trailhead that was almost immediately after the 4-wheel road started). Bumping along, you will note that you are winding above the Observatory, and at some points will be able to see the lava dam above the buildings. At odometer 18.9 is a fork in the road, take the left road (the one that angles up). At odometer 19.4 is another fork. Either road will take you to the same point, and we originally took the left fork but ended up backing out and going the right (straight) fork as the left fork had quite a difficult section in it. Both roads at this point are fairly difficult. Just past this part we encountered a section with loose, sinkable, rocks that unfortunately ended up causing one of the vehicles to slide and get a larger boulder firmly wedged, preventing it from going forward. At this point we, in the lead car, were a good bit ahead of the stuck vehicle before we realized that nobody was behind us. Backing down the road and around a curve we encountered the stuck vehicle. Attempts at dislodging the rock by hitting and tugging it was futile, and time was slipping away for our hikers who wanted to begin their part of the hike in a timely manner. Luckily, John had the brilliant idea of using the vehicle's jack to lift the vehicle up enough to enable the boulder to be removed - which worked very well enabling us to continue in a fairly timely fashion. Back on the road again, at odometer 20.0 go left at the fork and at odometer 21.3 take the right (straight) fork. As you approach the odometer 21.6 point you will begin to see some crooked sticks on the various intersecting roads. At the 21.6 point take a right, following the weathered brown markers with white reflectors and crooked sticks. At odometer 21.7 take a right and then in two miles down the road, at odometer 23.8 you will reach the gate. Whew! Kidneys still intact? (We think not). Take a breather here for a bit, have some pu'pu (snacks) and water and take in the view. At the gate itself, facing the gate, there is a hollow lava tube on your left and a small red rock hill on the right. The lava here is very pourous and huge rocks are very lightweight. Avoid the desire to climb or explore the hollow lava tube. On a previous trip with other friends, one of them climbed the tube and fell through seriously injuring their legs. The tube is not stable and the lava is very sharp and dangerous. The gate is the boundary of the National Park - and unfortunately today we found it locked. Ok, time for me to vent. The GATE IS LOCKED. Are you listening National Park people? I know you read this site. There is NO reason for that gate to be locked. Your little sign on the gate, saying "no ATV vehicles" is ridiculous - people don't ATV up here... just getting here is grueling - not to mention little oxygen and ATV swallowing lava tubes. Locking this gate is DANGEROUS - you are requiring people to turn around, abandon their vehicles, and hike when they didn't anticipate hiking. What about Native Hawaiians who wish to make offerings at the summit - you are forcing them to take unexpected trips - possibly putting them in danger. It is our taxes that pay your salaries - we don't want them to go into locks to keep us out of our own parks! Ok, sorry about that. Did I mention that the gate was locked? Grrrrr. If the gate had not been locked we would have continued through and a bit down the road where the trail crosses the road. At that point we would have dropped our hikers off, who would have taken that trail to North Pit and then onward to the summit. We would have continued on the road, for a couple more uneventful miles, to the summit scientific station (which consists of some solar arrays, transmitters, seismic and tilt equipment and weather equipment). We would have parked at the summit station and walked the 500 yards or so to the summit for a spectacular view of the summit crater from the highest point. We would have waited for our hikers to appear and then, after refreshments, turned around and drive back down. But alas, that was not to be on today's trip, and very well might not be what you experience when you take this trip. That in mind, John mentioned that from the gate it is about a half mile walk to the edge of North Pit - so all 11 of us decided to do the hike (in reality, it is a bit more than half a mile, but not much more). 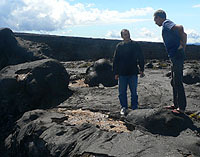 We have completely documented the hike to North Pit in our Hike To The Summit Of Mauna Loa review. Please refer to the review for details on the hike from this point on the road. Leaving from the (grrrrr) locked gate we turned around (we are keeping our odometer going here). Remember that we are taking an alternative route down the mountain. At about odometer 25.8 take a right hand turn. You are now on a different road than you came up. Stay on this road until it intersects the paved summit road at about the 28.9 odometer mark. Then make a right and continue back down the mountain the same way you came up. This 3-mile road is loose rock that is easy to sink into (which is why you can't take this road up, only down, without getting stuck). Much of the time we felt as if the vehicle was skating sideways, as it most certainly was. But the road out is fairly fast and not too difficult, the worst section being a rather steep and rocky area just before the end. This page is named 'Drives.loa'. Can't Find It?